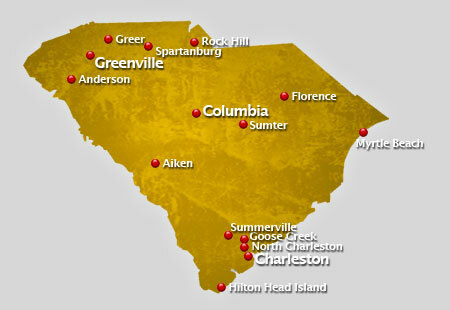 AirSign provides extensive aerial advertising coverage throughout all areas of South Carolina. From beach aerial advertising to sporting events and over busy highways, we'll display your message to crowds in a way your audience will be certain to remember. One of the southern states of the US, it was originally a part of the province of Carolina and declared independence from Britain during the Revolution. Carolus was the original name for the Palmetto state in honor of King Charles I. There are a lot of wonderful places to visit in South Carolina that include Sandhills and the Blue Ridge Region. Many of the state places contain salt marshes, estuaries like Charleston and Georgetown, and there are a lot of bays all around. There are also many major lakes and rivers that are found in the South Carolina like Lake Moultrie, Lake Greenwood, Lake Jocassee and Lake Hartwell. A humid subtropical climate envelops the state. It enjoys hot and humid days in the summer and very mild winters which are ideal for many. The summer tends to be wetter, though since precipitation is abundant all through out the year. Cyclones are usual as well as tornadoes, thunderstorms and hurricanes. Higher education had been a big priority for the state and the evidence is the huge number of colleges and universities that receives funding from the government to support the study of liberal arts, religion and military tradition. Examples of these are Colonial Colleges, the College of Charleston, University of South Carolina and the Wofford College. Crowds are an aerial advertiser's paradise! A typical flight over popular events or locations can result in as many as 8,000,000 impressions! Have us fly your aerial banner over the crowds in South Carolina to put your message wherever you want, whenever you wish at the best value in mass marketing!